This week I’m reviewing my first album that I consider obscure. It’s not an internet sensation nor has it defined a decade. 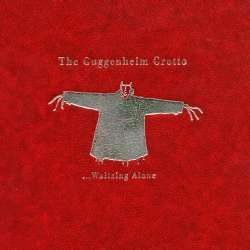 So let’s take a look at …Waltzing Alone by folk band Guggenheim Grotto. Worth Your Time? If you’re in the right mood. Twitter Review: …Waltzing Alone is like a finely aged scotch. You sip it slowly appreciating the individual flavors and smells that surround it. So many instruments. All three band members are multi-instrumentalists so there’s more going on here than your average album. You can tell they searched for that one instrument to give them the exact sound they were looking for. Look ma, no drums! There’s quite a few tracks that do not not make heavy use of percussion. Maybe that’s not special for folk music, but as your average listener it stood out to me while listening this week. Is the Cake a lie? My wife says Wonderful Wizard sounds like a Cake song. And I have to agree. They are one trumpet away from it being on Prolonging the Magic. Low Points: There was actually one point in the chorus of the song I Think I Love You that infuriated me nearly every time I listened to it. He says “Hell I want to scream” but at no point does he ever raise his voice to anything close to a scream. I guess I have the mind frame of show me/not tell me when it comes to writing and that chorus is nothing but tell. But this album’s biggest downfall is that you really need to be in the right mood to appreciate it. Some of my favorite albums bring a mood to me and not the other way around so I think it deserved to lose some stars because of that. If you don’t agree I don’t care because yeah, well, you know, that’s just, like, your opinion, man. Anything Else: There’s something worth mentioning here outside of the music that makes this album worth owning like as in a physical copy kind of owning. They really put incredible effort into the album’s packaging. It’s basically a small book with red leather texture and silver embossed text. That right there is pretty special since your average CD comes in a plastic jewel case that you’re never going to make any kind of connection with. If it cracked you would simply replace it with another one that looks exactly like it without ever giving it a second thought. In a word: disposable. The liner notes begin with 5 pages worth of excerpts from an online discussion on a site dedicated to graphic design about the current state of CD packaging. 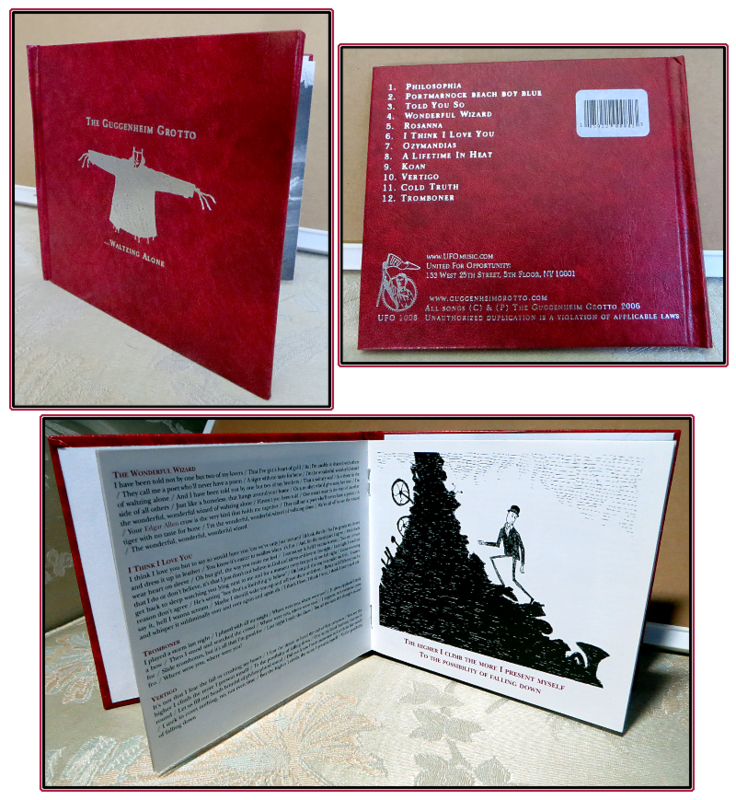 This is followed by the lyrics for each song with several illustrations related to the lyrics. Then it closes out with commentary by Shane, Mick and Kevin for each of the songs that brings insight into what was going on inside their heads such as that they were all heavily listening to Marvin Gaye when Vertigo was formed into being. You really don’t get this level of detail and discussion with your average album. Do yourself a favor and hunt down the CD rather than downloading the MP3s if you plan on getting this album. I’ve included some pictures to help you visualize the awesomeness. On a random note, my wife and I were at the concert where the Vertigo video I just linked to was recorded. We high tailed it up to Cleveland to see a They Might Be Giants concert where they performed Flood in it’s entirety. And that is where I first became acquainted with The Guggenheim Grotto and, like with most opening acts, I bought their album.